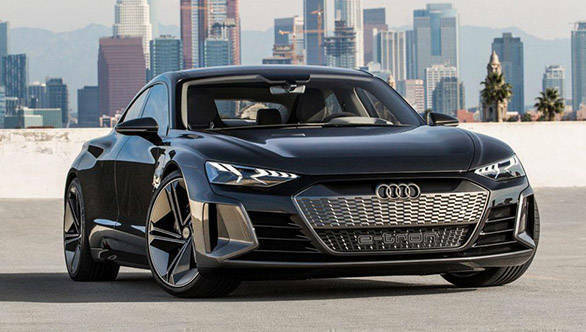 Audi has taken the wraps off its new concept electric vehicle, christened the e-tron GT at the LA Auto Show. The new e-tron GT concept is the third electric vehicle in the Audi lineup, following the e-tron SUV and e-tron Sportback that will be launched next year. The launch of the production e-tron GT will follow after that. 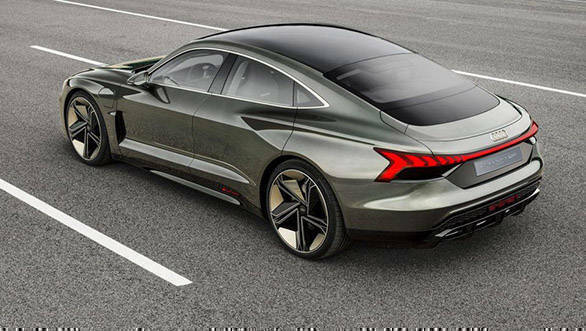 The e-tron GT concept is a four-door coupe made using lightweight materials that includes aluminium and high-tensile steel. The concept car is 4960mm long, 1960mm wide and 1380mm high. The design looks quite futuristic but at the same time, the classic sloping roof line is representative of the unmistakable GT style. The wide haunches at the rear lends an imposing stance and the bar of LED tail lights that stretches across the boot lid to merge with the tail lamps is typically Audi. There are aerodynamic slits and intakes on the front end to cool the batteries and the brakes as well. As is the case with new age Audi's the e-tron GT concept is also kitted with Matrix LED headlamps with laser high beam. The interior looks as futuristic as the exterior. The instrument cluster and infotainment system has a floating effect and all around, there's use of light colours to create an airy ambience. Since EVs are regarded as eco friendly, the fabric used for the upholstery is made of recycled fibres. In keeping with its Gran touring intent, the e-tron GT has 450 litres of boot space at the rear with an additional 100 litres available under the bonnet. The e-tron GT is powered by a set of electric motors with a combined system power of 590PS. There are separate, permanently excited synchronous electric motors for the front and rear axles that power all four wheels, an electric quattro if you will. The ECU controls the amount of torque being sent to the axles as well as between the left and right wheels. Audi sayss the car can sprint from 0-100kmph in 3.5s and 0-200kmph in little over 12 seconds. Top speed is restricted at 240kmph. The claimed range is 400km on a single charge of the 90Kw lithium ion battery. The battery can be charged by either using the cable behind the flap in the front of the car or by contactless induction using Audi's wireless charging feature.